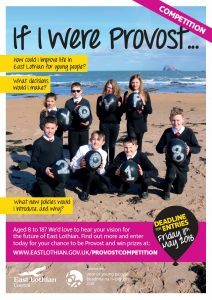 The council has launched If I Were Provost – a competition that asks young people what would they do if they were ‘in charge’, how they would improve life for young people in the region, what new policies they might introduce and why. Or any creative approach that you think is best! One winner from each category will be invited to act as a Young Provost alongside Provost John McMillan at a number of events throughout 2018. The winners will also receive a goody bag of gifts from East Lothian tourist attractions. The winning entries, plus a selection of entries received, will be on display at libraries throughout the county during the summer of 2018. The closing date for entries is Friday 11 May 2018.